In addition to being a communicator, Jami wears many hats. She’s a mom to two daughters, Kate (5) and Quinn (3), wife to Travis, daughter to Tom and Sherri, sister (she’s the middle child) to Todd and Adam, and granddaughter to her favorite almost 90-year old grandpa, Charley. Jami was born and raised in Kingfisher, Oklahoma, which is a town of about 5,000 people with three stop lights. After graduating high school, she applied to only one university – Oklahoma State – and moved to Stillwater where she fell in love with all things orange. She went into undergrad focusing on Journalism/PR and never looked back, but did add a minor in Spanish along the way. 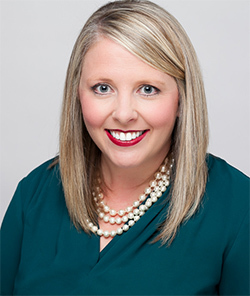 She received her master’s degree in Communications at the University of Arkansas while working full-time in Walmart’s International Corporate Affairs division. There are a few people who inspired her in different stages of her life. She remembers, as a child, her Grandma Patsy looking up words in the dictionary that she didn’t know the meaning of or how to spell, and encouraged Jami to do the same, teaching her a love for words at an early age. In high school, she worked at the local Kingfisher newspaper, around some truly witty writers, who made the world of journalism and communications seem fun! And, as always, there’s that one professor who takes an interest in you and fuels your passion, Jami had that in her Public Relations professor at Oklahoma State, Shelley Wigley. cations capacities across the company’s Walmart International division, Walmart corporate, and most recently Sam’s Club, doing everything from media relations and internal communications to speech writing. Although coloring or going to the park with her daughters are at the top of her list of hobbies, Jami also has another hobby she enjoys: tennis. She’s not really working to become the next Serena, but does love playing tennis in her spare time. When asked if she has any tips for success, her suggestion: talk to everyone! In her opinion, networking and best practice sharing are the primary benefits of organizations like IABC. There are so many smart people with different communications backgrounds doing interesting work and you can learn something from everyone. From communicators working in non-profits to corporations, we all have a common mission of sharing information with our stakeholders, whether internal or external, in an engaging and creative way.